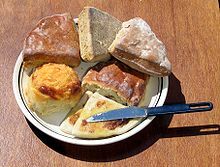 A potato scone or tattie scone (tottie scone in some parts of Scotland) is a regional variant of the savoury griddle scone which is especially popular in Scotland. Many variations of the recipe exist. They generally include liberal quantities of boiled potatoes, butter and salt. Potato scones are traditionally made as circles about 6 inches (15 cm) across and then cut into quarters, or farls. They may also be baked in small rounds. They are generally unleavened and are thinner, 7 mm or so, than what is usually considered a scone. They are often served as part of the full Scottish breakfast with fried eggs, bacon and lorne sausage. Alternatively, they are often eaten in a roll, usually accompanied with either lorne sausage, bacon, or fried egg. They can also be eaten like a wheat scone with jam and a cup of strong tea. A typical potato scone is made with mashed potato (potato and butter—no milk is used—with salt to taste) and plain flour is added to make it into a dough which is then rolled out and put on a griddle to cook. They are traditionally served hot, and cold potato scones are often reheated by toasting or frying. Potato scones contain a small proportion of flour to a large proportion of potatoes: one traditional recipe calls for two ounces of flour and half an ounce of butter to a pound of potatoes. ^ Leah, Hawks. "Potato Scones". Retrieved 5 February 2014. ^ "How to cook the perfect tattie scones". The Guardian. Retrieved 9 January 2013. ^ "Traditional Scottish Recipes — Potato Scone". rampantscotland.com. Retrieved 12 September 2009.